Trying to decide what to pack for your lunch this week? 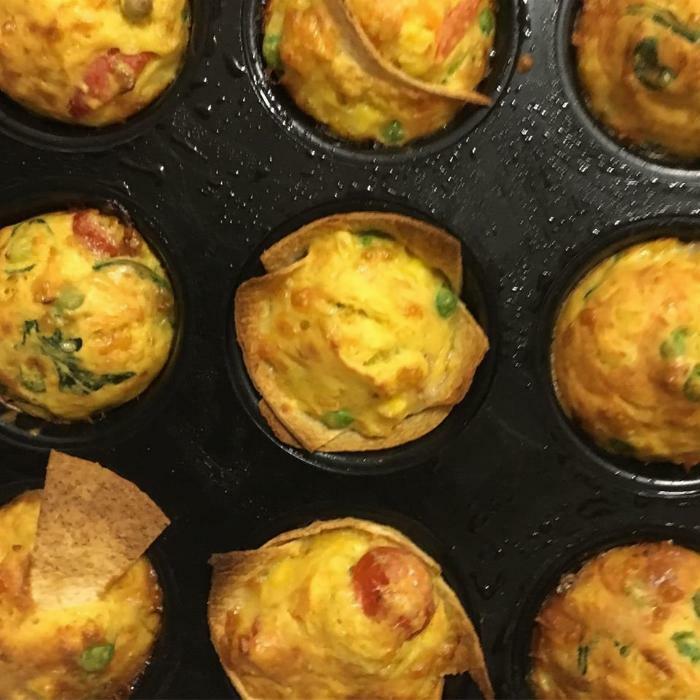 These veggie-packed savoury muffins are super easy to make and taste delicious. 2Drizzle some EVOO into a hot frying pan, and sauté the grated carrot and baby spinach for 2 minutes, or until the spinach has wilted. 3Meanwhile combine frozen peas and corn in a small container and cover with boiling water to thaw. 4Remove the carrot and spinach mixture from heat and transfer to a bowl. Drain water from the now thawed peas and corn. Add peas, corn, tomato, spring onion, cheese, eggs and flour to the mix. 5Stir all ingredients together until well combined. 6Grease the muffin tray with EVOO. Cut each wrap into thirds and use the wrap pieces as the muffin cases. 7Portion the mixture between the muffin cases and bake for 15-20 minutes, or until golden. 8Allow to cool for a few minutes, then enjoy.